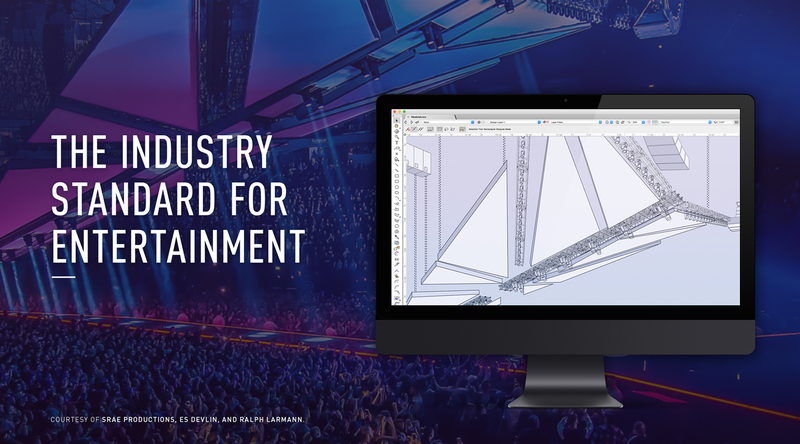 Attendees will be able to speak with our staff, including Jim Woodward, senior entertainment industry specialist, and Neil Barman, product specialist from the newly integrated Canadian office, as they share how our software helps support the entire design process within the entertainment industry. Along with demos and discussions, our staff will offer a two-part workshop over the course of the event. The first seminar, “Vectorworks Spotlight 2019 – The Total Production Solution,” will demonstrate new features such as updates to Braceworks, the structural analysis add-on module and our real-time previz application, Vision. The second seminar, “3D Conceptual Production Design with Vectorworks Spotlight,” will showcase our approach to speed-draw production designs within Spotlight. We’ll show you some simple, yet powerful tools developed for “on the fly” presentations and conceptual development. The workshops will take place both days from 2:00-3:00 p.m.
Find out more about these sessions! Before and after the workshops take place, our team will be available to chat and offer free demos of Spotlight, Vision, or Braceworks at booth #170. You’ll also be able to pick up some Vectorworks swag and enter for a chance to win a free 4K monitor! Be sure to follow our Twitter page for the latest surrounding Expo-Scène 2019. Jim and the Canadian team are excited to meet with the best and brightest in the industry! For all your Canadian support needs, contact CAinfo@vectorworks.net or 604-878-0289.